Parts work takes sophistication to execute well, but it is ultimately not complicated. It engages people in learning to hold and creatively apply the whole of themselves—to effectively draw on all the characters in the play/crayons in the box. Parts work has particular significance both because it provides a methodology that directly supports culturally mature perspective and because it provides important insight into just where such perspective takes us. 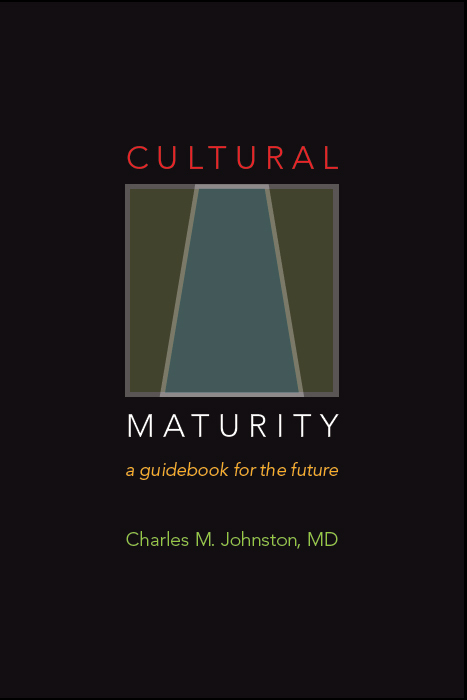 We can think of parts work as providing a hands-on definition for Cultural Maturity. Up until now in culture’s evolution, we’ve tended to view the world from the perspectives of particular characters/crayons. For example, with Modern Age romantic love, we relate from a “handsome prince” part of ourselves and engage a “fair maiden” part in another (or the reverse). With Modern Age leadership we act from a heroic part in ourselves and engage a dependent, follower part in another (or the reverse). With Integrative Meta-perspective, we become newly able to perceive and act from the whole of who we are. Two-haves-make-a-whole relationships give way to the possibility of more Whole-Person bonds. Identity becomes systemic—fully encompassing—in a way that has not before been an option (see A New Meaning For Love, Rethinking Leadership, and The Myth of the Individual). Parts work provides a way to directly promote these changes. Parts work takes us beyond other ways I often talk about how culturally mature perspective helps us hold our cognitive complexity more systemically—for example, understanding multiple intelligences and “bridging” polarities. With regard to multiple intelligences, parts work let us get past just thinking about different ways of thinking and directly engage them. Various characters/crayons embody different aspects of intelligence. And the process itself, rather that just being analytic or just emotion-based as we commonly find with traditional psychotherapeutic approaches, draws simultaneously on all aspects of intelligence’s multiplicity. The method also helps us get beyond traps commonly encountered when using polarity as a way to think about complexity’s aspects. Polar aspects take expression as parts. In doing parts work one establishes a new kind of relationship with parts. Parts don’t get to take over. But neither does one seek some middle ground between parts. One learns to lead from oneself as a whole person and draw on parts as creative aspects. My second book, Necessary Wisdom, drew specifically on “bridging” polarities as a way to grasp where culturally mature perspective takes us. I thought this approach would provide an easy way in for people. Sometimes it does, But even with detailed explanation, very often people confuse “bridging” with oneness or compromise. These distinctions are built into parts work’s more hands-on approach. Let’s look briefly at some of the basic methodology of parts work. I’ll follow this by offering an example. I’ll then address some of the alternative ways parts work can be applied and different settings in which it can be used. Imagine sitting in a chair (this is the Whole-Person identity chair) and placing your most important parts around you in other chairs (perhaps an intellectual part, an angry part, a scared part, a sensitive part, a sexual part). Parts work starts with learning to distinguish yourself from your parts. Prior to doing the work, it is common for parts to in various ways take over, engage the world as if they are us. Parts work’s “rules” support this first step. The first cardinal rule in parts work is that parts don’t get to be in charge. The second cardinal rule is that parts don’t get to relate to the world, only with the Whole-person identity chair. These rules are modeled in the room in my relationship with the person I am working with. For example, I take care to relate only to you in the Whole-Person identity chair. They are also reinforced in the structure of the work. A snapshot of how a session might proceed takes us a bit further: If you have a question you would like to explore, I might have you first articulate the question as best you can to your parts. I might also have you tell the parts where you have gotten to thus far in answering the question. Then I might invite you to get the input of each part, to, in turn, go to each chair and see what it has to say. Finally, after giving you some time to reflect, I might suggest that you to make a “leadership statement” to the parts summarizing how your thinking has involved through your engagement with them. Notice that there are two kinds of processes implied in this simple description. Each is key to culturally mature perspective’s changes. First is that which I have described— learning to know the difference between yourself when you are in the Whole-Person identity chair and when you are in a part. This first kind of process involves separation and distinction. The second kind of process is reflected in the ensuing conversations. It involves a new and deeper kind of engagement with parts. Using the box-of-crayons metaphor, the first is about not confusing yourself with particular crayons. The second is about learning to appreciate and draw on all the various colors. This dual process helps bring more systemic perspective to the question you wished to explore. But with time, applied to many questions, and not just personal questions, but also questions of a more social/cultural sort, it brings about a more important result—Cultural Maturity’s needed cognitive reordering. We can think of the result as a kind of “rewiring.” Before doing the work, “wires” go from parts to the world. Afterward, “wires” go between parts and the Whole-Person identity chair only. Just the Whole-Person identity chair has a relationship with the world. And there is another rewiring piece. 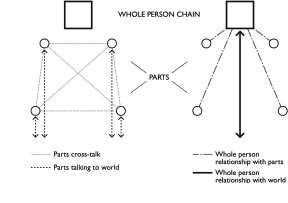 Before doing the work, “wires” also go back and forth between parts (this cross-talk is what creates chatter in our brain and is reflected in various forms of internal conflict). A third cardinal rule is that parts don’t talk to parts. “Wires” between parts, like those between parts and the world, are in a similar way cut. “Bill’s father had died. The immediate reason Bill had come to me was the depression that the loss had evoked. But with time, along with addressing grief, he recognized a further concern—what he described as a war within himself. Bill’s father had left him a beautiful piece of land that had been in the family for generations. Bill loved the place and planned to construct a cabin and move there when he retired. But new zoning regulations had made the land unbuildable. Suddenly, his plans were on hold. He felt deeply sad—and angry. The particular situation disturbed him, but even more disturbing to him ultimately was the way his response to it had left him torn from the comfortable moorings of a once-unquestioned set of beliefs. He was known for banging heads with property rights proponents and more often than not emerging victorious. Now disparate internal voices were advocating not just different social policies, but two very different—and contradictory—views of the world. Bill found distress and confusion in this conflict and asked if we could somehow explore it. I agreed. But I recognized that such work would present some difficulties. Bill was an exceptionally intelligent man with well-thought-out beliefs that were not easily questioned. We would have to do more than just talk if I was to be of help. I began by having Bill imagine that the warring parts were like two characters on a stage. I asked him to describe everything he could about each character—what it wore, its age, the expression on its face. Then I had him invite them into the room. The environmentalist sat stage left, sensitive features, longish hair. The property rights advocate stood more distant, stage right, stockier in build, baseball cap tucked between his crossed arms. After a bit, he too sat down. I instructed Bill to turn to the two figures and describe the issue he wanted to address. After a bit of initial self-consciousness, Bill proceeded to talk with them about the land, the new regulations, the deep conflict he felt. Then I suggested that he go over to each chair and speak as that character—become it and give voice to what it felt about the questions at hand. I had him return to his own chair when each character had said its piece and from there to respond to the chair that had spoken and follow up with any further questions he might have. I instructed him to let himself be surprised by what each character might say. This back and forth went through several iterations, first Bill speaking, then in turn, each of the parts. The character in the left chair spoke of the importance of protecting the environment in its natural state. The character on the right argued that government had no right to dictate what a person did with private property. Both expressed a longing to live in such a beautiful place. As the dialogue progressed, Bill’s relationships with each of them deepened. He became increasingly able to find a place in himself where he could both respect what each character had to say and see limits to its helpfulness. After some time, Bill again turned to me. He said he felt a bit disoriented, but that the conversation had helped. He commented that much of what the two characters said had indeed surprised him—and moved him. He found it particularly enlightening that each character seemed essentially well-intentioned. Before he had framed the environmental/property rights con ict as a battle between good and ignorance (if not worse). The work showed him that it was more accurately a battle between competing goods. Initially, it had been hard for him not to identify with the environmentalist, but, with time, he recognized that in fact each gure had important things to say. The brief piece of work hadn’t given Bill a final answer for how to approach the property issue. But it had given him a more solid place to stand for making needed decisions. He had begun to see a more full and creative picture. Later I asked Bill what broader implications the exercise might have for his professional efforts. We decided to continue with the hands-on approach. I tossed him particularly thorny questions that pitted environmental concerns against property rights concerns. His task was to hold his Whole-Person chair, and from there to use his two “consultants” to help him determine the most effective and fair approach. The result in each case was a deeper understanding of the dilemmas involved and, in several instances, novel solutions. This example is highly simplified. Such work most often involves more parts than just two, and it may take several months of work before a person can sit solidly in the Whole-Person—whole-box-of-crayons, Integrative Meta-perspective—chair. But the example illustrates a general type of method that is both straightforward and highly effective. *Sometimes more parts are appropriate simply because the questions at hand involve more than two aspects. But it is also the case that people with different personality styles tend to work best with different degrees of differentiation. With some temperaments, having just a couple of characters in the room will prove most effective; with others, as many as seven, eight, or more. As a therapist, I draw frequently on this kind of approach. I don’t know of other techniques that apply all of intelligence’s multiple aspects so simply and unobtrusively. I also don’t know of other ways of working that so directly support culturally mature perspective. It does so not just through what is said, but through every aspect of the approach, even the layout of the room. Of particular importance, the fact that I as a therapist speak only to the Whole-Person chair (one of those rules) means that my relationship with the client directly models and affirms Whole-Person relationship. Through the work, culturally mature perspective and responsibility become directly acted out and embodied. Ongoing work with this kind of approach alters not just how a person engages specific issues, but also how he or she engages reality more broadly. 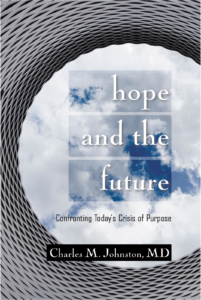 The work becomes like lifting weights to build the “muscles” of culturally mature capacity. One of the litmus tests for success with this kind of approach is the appearance of culturally mature shifts with regard to questions that have not been directly discussed. This same general kind of approach can also be applied to working with more than one person. I often use related methods when assisting groups where contentious issues have become polarized, or with groups where people wish to address many-sided questions that require careful, in-depth inquiry. When working in this way, I place individuals or small subgroups around the room to represent the various systemic aspects of the question at hand (the various characters/crayons). Another subgroup, seated in a circle around the smaller groups, is assigned two tasks—first to engage these subgroups in conversation to clarify their positions, and then to articulate a larger systemic perspective and explain how that perspective could be translated into right and timely action. These various Parts Work techniques might seem to represent a specifically psychological kind of methodology. But in potential, they have much broader application. Because of the particular ways they are structured and the Whole-Person relationship the facilitator maintains with the individual or group doing the work, such approaches could ultimately be used anywhere engendering culturally mature capacities is an appropriate objective. I think most immediately of educational settings. While today we are not at the place where people would be comfortable utilizing these kinds of approaches in schools, it could be powerful to do so. Such methods would be most obviously a good fit where the task was interdisciplinary learning. But in the end they could be just as useful with education that focuses on particular kinds of knowing, such as religious education or the education of scientists.